Chinese search giant Baidu is facing a chorus of complaints for allegedly stealing online video content from rivals, resulting in a 300 million yuan (US$48.9 million) lawsuit against the Internet company. Four online video providers in China, including Youku Tudou, Sohu and Tencent, said on Wednesday they had filed the legal action, and accused Baidu of promoting online piracy. Joining them in the suit was the Motion Picture Association of America and Dalian Wanda Group, a major Chinese entertainment and film company. "Under this situation, we really will have no way to compete," said Sohu CEO Charles Zhang in a press conference. "We've spent so much money buying online content, but half of our user traffic goes to Baidu video." Known as the country's largest search engine, Baidu also runs services that host online video for PC and smartphone users. But many of these videos are sourced from rival sites that are paying millions of dollars in Internet bandwidth costs and copyright licenses, Baidu's competitors alleged. Rather than redirect users to the third-party site where the video originates, Baidu instead streams the content from its own web pages or PC and mobile applications. This deprives the rivals of crucial user traffic needed to sustain revenue. In some cases, Baidu will even display its own ads on the third-party videos, the groups claimed. 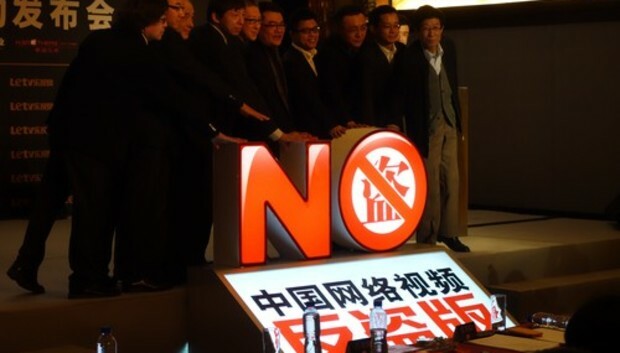 Baidu, however, said it also takes fighting online piracy seriously. In an email, the company said it cracks down on unlicensed content it finds or is alerted to. Since June, the search giant has blocked over 5.8 million links to pirated videos, it said. In addition, Baidu said it is responsible for 75 percent of Internet video searches in China. Every day, it brings 100 million user visits to online video sites with licensed content, the company added. Wednesday's dispute is not the first time Baidu has caught flak for piracy. Years prior Baidu faced similar criticism for its online music search, which allegedly funneled users to pirated songs on third-party sites. In 2011, however, the search giant struck deals to pay major record labels to access to their music catalogs. In China, some of the most popular pirated videos are U.S. movies and TV shows. Online piracy, however, has stolen potential revenue from services that legally stream the content online, the groups claimed. Instead, China's film industry, for example, still has to earn most of its cash from movie theater ticket sales. China is one of the world's largest markets, and U.S. Hollywood studios are trying to gain more access to the country's consumers. Its film box office is growing fast and could surpass that of the U.S. in 2020, according to a study from consulting and services firm Ernst & Young.